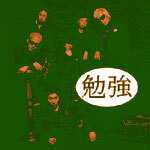 MEMBERS: Atsushi (vocals), Takahiro (vocals), Makidai (performer), Usa (performer), Matsu (performer), Hiro (performer). AGE: Atsushi - 04/30, Takahiro - 12/08 Makidai - 10/27, Usa - 02/02, Matsu - 05/27, Hiro - 06/01. This group originally formed with Hiro, Matsu, Usa, and Makidai as performers (which they still are now), and Sasa as the vocalist. Shortly after their debut, Sasa moved up to become a song writer for the group. Upon auditioning new vocalists, they came across Shun and Atsushi. In 2006, however, Shun left the group to pursue his own solo career. The group would then hold an audition to find their new replacement vocalist. This vocalist turned out to be Takahiro. Bloodtypes: Atsushi - A, Takahiro - O, Makidai - O, Usa - AB, Matsu - O, Hiro - AB.